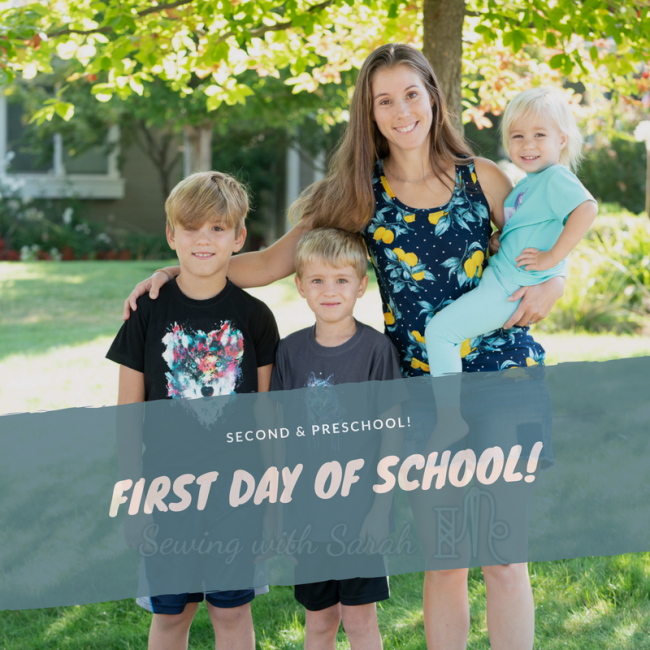 You might have noticed the blog’s been a little quiet the last few weeks- that’s because we were trying to soak up the last rays of summer, while also prepping (homeschool-mom style) to dive into another school year! Although we do school in some form nearly year-found, we had our first “official” day of school last week, complete with all the trappings: waffles with unlimited syrup, new notebooks and goodies, lunch out at their favorite restaurant, and OF COURSE, new mama-made t-shirts and back to school photos! At this point, you might feel like your feed’s a bit flooded with these types of pictures, but I’m going to add mine to the pile anyway, because 1) I love how these shirts turned out and 2) I’m a sucker for school traditions. Don’t worry, I’ll be back to blogging about new patterns and such soon, but for now, here are my newly minted second graders and preschooler, sporting their new duds! The black shirt is made from MVC from So Sew English Fabrics. When asked what this mysterious fabric feels like, I can tell you that its pretty much exactly what would happen if rayon spandex and bamboo had a perfectly well behaved fabric baby- smooth, almost silky, and really easy to work with. 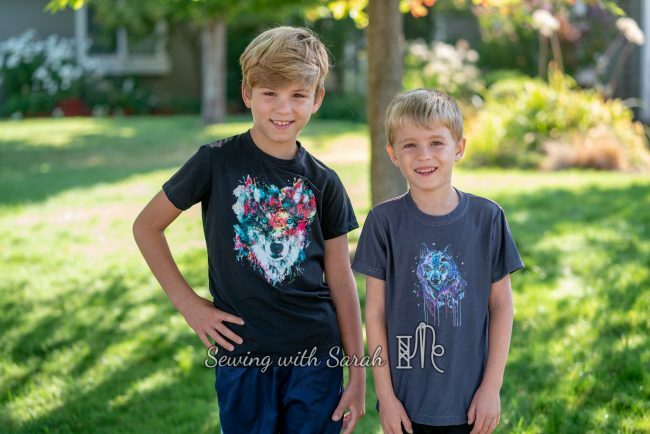 Oliver (in the grey shirt) and Sophia (turquoise) are both wearing tees made from denim knit from Surge Fabric Shop– another really great fabric, especially for kids. I’ve used it before, and it holds up amazingly well to repeated washings and abuse- a total win in my book! 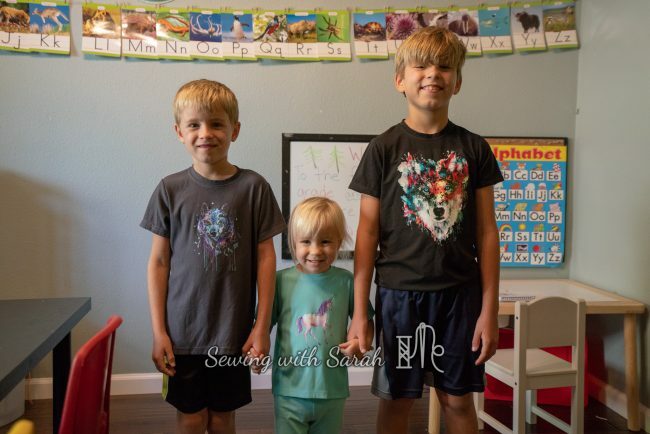 I used Jalie 2918 (made before here) for all three shirts, sizing up one size for the boys because they grow like weeds, and because they like things a bit loose. 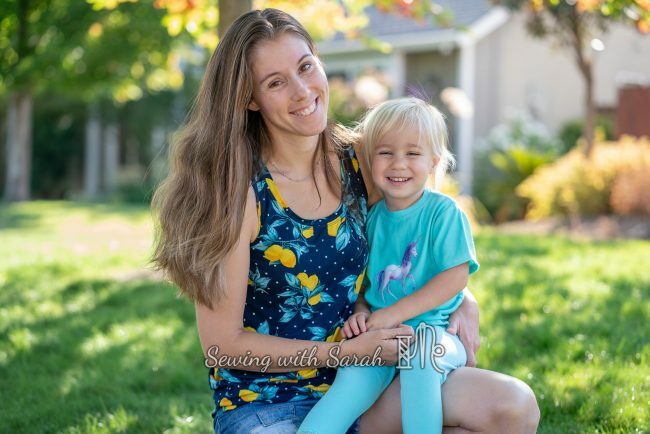 Despite being a boys pattern, the fit turned out great on my girl as well- don’t you just love patterns (and curriculum) that work for all ages and stages? The pattern doesn’t actually go down to a size 2, so I simply shortened the size 3, and took a larger seam allowance- I’m pretty happy with the result! Last year’s tees were very school oriented, but this time, I wanted to make them something a little more versatile, so I let them pick out a heat transfer vinyl design from Surge, and applied it to my shirts once they were finished. Sure, I could have used store bought tees, but where’s the fun in that? Unfortunately, this is where the project almost went totally awry- the heat press left a very visible shiny rectangle on the denim knit shirts, despite using a t-shirt pad and a teflon sheet. I was about to toss them in the bin, when my husband decided to try washing them- and low and behold, the shiny-ness completely disappeared! 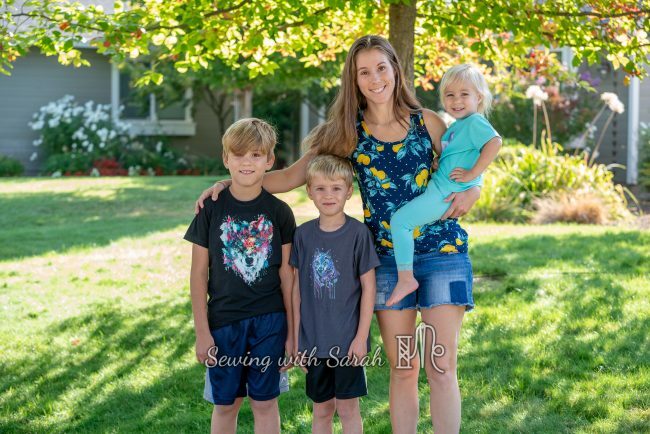 Other than this near miss, the project came together really well, and the kids love their shirts, appreciating them enough to pose for a few quick pictures in the front yard, before running back inside to get started for the day. Here they are comparing their prized gift of new hand-sanitizers- can we all just pray for a healthy year?? I know you other mamas feel me on this one! Here’s a quick snapshot inside the school room- thought I should document it while it’s still clean and relatively organized. While I can and do school out of the RV when we travel, I love having a little home base to do our studies, and keep our supplies! Little miss even has her own desk area this year, which she loves! The only member of our classroom (besides me!) who didn’t get an outfit is our classroom pet- our dog Ellie. I think she deserves a shirt too- any suggestions for some good doggie patterns? Drop a comment below! Want to catch more of my projects? Follow me on Instagram here, or subscribe to my blog for email updates! Note: This post contains affiliate links. Thank you for your support! I loved this post! Your boys are so handsome and your little girl is adorable. God Bless you for being able to home school along with the regular home “stuff” that must be done. 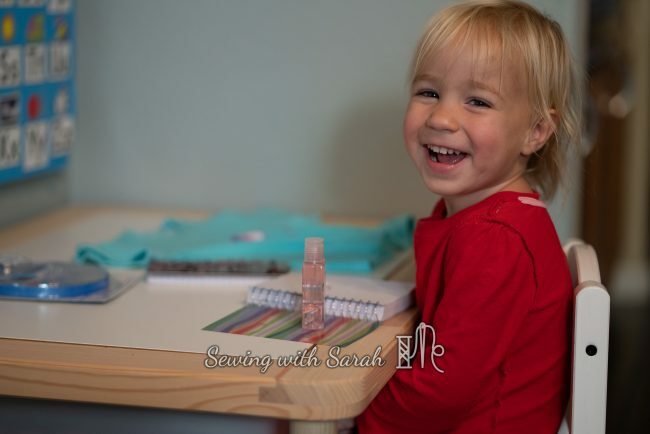 How on earth do you find time to sew and blog? I think I need to borrow your cape…. haha! I always feel like I’m running to catch up, but overall I love this life! 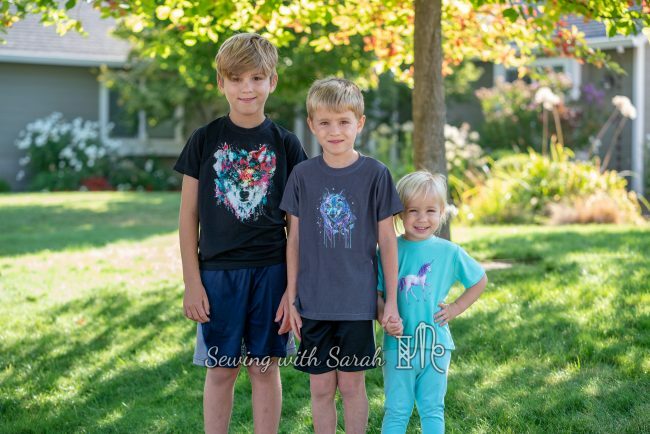 Sew Bratty has a dog tshirt pattern that is really easy and turns out cute. 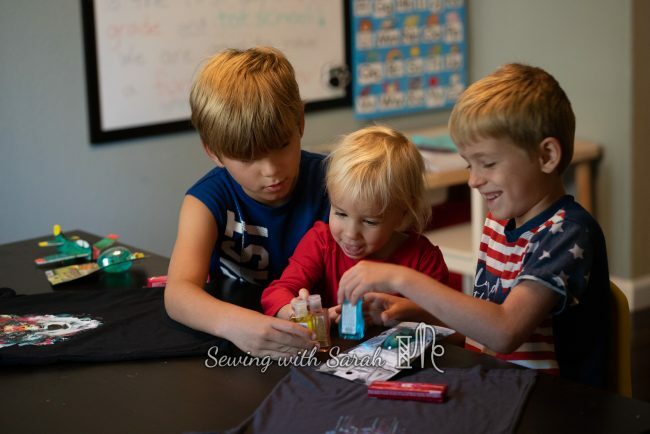 Love your homeschool traditions! I’ll check it out, thank you!